Joel Embiid (7'0''-C-94, college: Kansas) had 41 points and 13 rebounds, helping the Philadelphia 76ers beat the Los Angeles Clippers 122-113 on Thursday night. It was Embiid's sixth game already this season with at least 30 points and 10 rebounds. Ben Simmons added 14 points and 11 assists, bouncing back nicely from one of his worst games as a pro. Markelle Fultz provided a spark late in the third quarter and finished with 12 points, nine rebounds and five assists while helping Philadelphia improve to 5-0 at home. 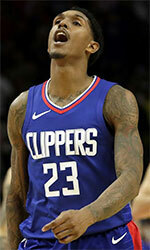 Lou Williams (6'1''-SG-86) scored 26 points for the Clippers, and Danilo Gallinari (6'10''-SF-88) had 25. Tobias Harris (6'9''-F-92, college: Tennessee) finished with 24 points. Philadelphia led by as many as 11 in the final quarter on Embiid's follow dunk, but the advantage was just three with 6:16 remaining. Embiid then scored nine of the next 12 points, including an emphatic dunk over Boban Marjanovic (7'4''-C-88, agency: BeoBasket) with 1:39 remaining that gave Philadelphia a 117-109 lead. After Embiid made the second of two free throws with 1:14 to play, Philadelphia fans began chanting "MVP! MVP!" The Clippers trailed by as many as 22 points in the opening half and were down 72-57 entering the third quarter. But Los Angeles slowly chipped away at the deficit, going in front for the first time on Gallinari's three-pointer from the right wing that made it 81-80 with 3:58 left in the period. Another Gallinari triple put the Clippers up 84-80 before Fultz showed flashes of why Philadelphia drafted him first overall in 2017. Fultz scored on a goaltending call, and then assisted on Mike Muscala (6'11''-F/C-91, college: Bucknell)'s four-point play before converting consecutive coast-to-coast layups, helping the 76ers end the quarter on a 10-2 run that put them ahead 90-86 entering the fourth. Philadelphia shot 57.4 percent from the field and made 7-of-10 three-point attempts in a strong opening half. Simmons had 10 points and eight assists at the break after he tied his career-high with 11 turnovers in Tuesday's 129-112 loss at Toronto.